Someone needs to tell Caitlin Brotz that she could get a lot more than $12 for the anti-aging serum she developed from pomegranate, blackberry and carrot seed oil. After all, the big guns–the Lancomes and Crème de la Mers and La Prairies–charge up to hundreds of dollars per ounce for their anti-wrinkle creams. But don’t let the meager price tag fool you. One of her most ardent fans, a 50-something teacher, decided to pit Olivu 426’s Night-Time Repairing Serum against a popular Lancome product. For a month, she applied Olivu 426 to the left side of her face and Lancome to the right. Men in Sheboygan, she says, don’t like to admit they use “product,” but thanks to the influence of Brotz’s newly-minted husband, a semi-professional football player who uses Olivu 426 to control acne caused from sweating in his football helmet, they’re starting to embrace the more than 120 products offered by Olivu 426. Indeed, it was a male athlete who inspired Brotz to start making all-natural beauty products in the first place. When she was 22, her then-boyfriend, a semi-professional snowmobile racer, was building a track out of wood chips. When it accidentally caught on fire, he was burned on 60 percent of his body and life-flighted to Milwaukee. Because his body (and the resulting skin grafts) could no longer tolerate lotion with alcohol, Caitlin started researching all-natural products with healing properties. The 426 in the business name, in fact, was Adam’s snowmobile number. The other unique feature of Olivu 426 is that customers to the tiny 700-square-foot storefront are invited to make their own products, start to finish. 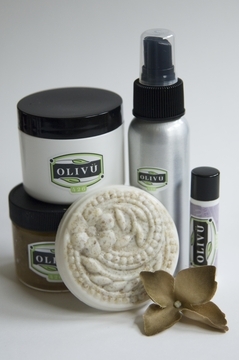 Just like paint-your-own pottery that spread across the country a few years ago, Olivu lets amateurs create such products as avocado whip lotion, emu oil body wash and lavender hydrating face mist. Or they can make lip balms, sugar scrubs, lotions and even insect repellent. 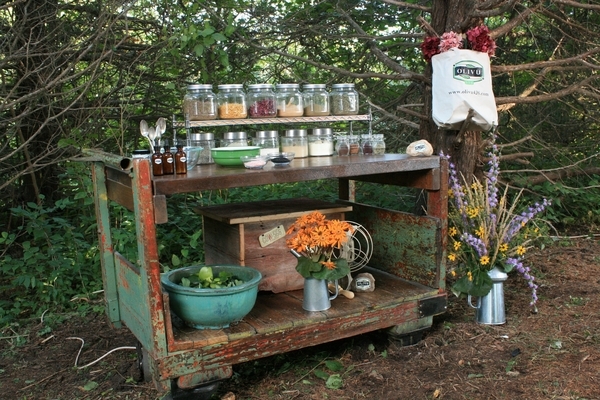 The hard part is choosing which of the 150 types of herbs, scents and essences to add to their potions. As far as she knows, Olivu is the only place in the world that offers customers that make-your-own option. “Oh, there are places you can go and add your own scent, but our customers get to do it from start to finish right in our own test kitchen using the same blenders we use,” she says. Eventually, she’d like to franchise the make-your-own aspect that is highly-popular with the Wisconsin bachelorette party set. Right now, she’s focusing on growing the internet business that makes up a good third of her business. “People visiting Sheboygan stumble into our store and get hooked, particularly on the anti-aging serums,” she says, adding that she has regulars from across the country and as far away as Japan. All, I have to say, Caitlin, is you better get ready. Olivu 426 is going to be huge. Olivu 426, 511 N 8th Street, Sheboygan, WI 53081, 920.783.0809. Great read, really informative, I love natural products so much and i’m always learning new tips! Thanks.